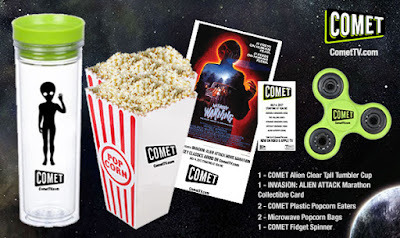 Mind on Movies is very excited to announce that we are working with Comet Tv on an Alien Attack Movie Marathon COMET TV Giveaway! June is an action packed month over at Comet TV! With so many films you can only see on the Sci-Fi and Horror channel! But that’s not all, did you know that this July is the 70th anniversary of the famed Roswell UFO crash? This July 4th beginning at 10AM/9C Aliens Invade! Say wha? Yep, to ring in the 4th, Comet TV is holding an Invasion: Alien Attack Movie Marathon! There’s Invisible Invaders (1959), The Falling (1987), Strange Invaders (1983) and more! Click Here to see the full schedule line up. To prepare you for this out of this world event, we have an amazing Alien Attack Movie Marathon Pack to giveaway! Only one entry per mailing address per giveaway. The prize will be sent via FedEx or UPS. No P.O. Boxes please. This contest is from Mind on Movies working with Comet TV. The entries will be checked.